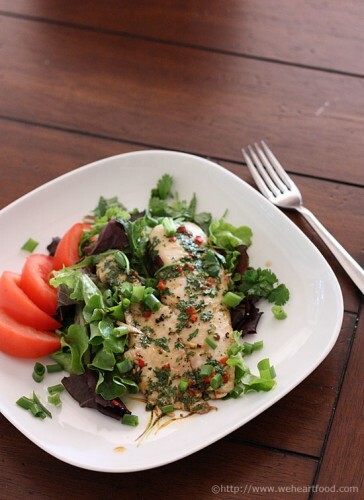 A month or so ago, we made this easy fish dish, adapted from a recipe in Fitness Food: The Essential Guide to Eating Well and Performing Better . The original used fish steaks (snapper, halibut, swordfish…) but we had a few tilapia fillets on hand and it sounded like a good match to me! We paired it with brown rice mixed with shaved carrot, ginger, green onion, and soy. Is there anything that doesn’t go with cilantro? Haha — true! Is this the dish you made because we happened to have everything in the house already? You know, I’m not sure. It’s been a long while. Damn catch-up posts… I do remember liking it though. I barely remember it, but I’m thinking the fact that it’s slathered with stir-fried mushrooms means I hearted it a whole lot. Mix the soy sauce, oil, rice wine, sugar, lemon zest, and lemon juice together in a shallow glass baking dish. Place the fish in the dish and turn to coat. Cover and refrigerate for at least 4 hours or overnight, turning over a couple of times. Remove from the fridge and allow to return to room temperature. Preheat the oven to 350F. Heat the sesame oil in a frying pan over medium heat and when hot add mushrooms. Stir-fry for 3-4 minutes or until they start to soften, then add in the scallions, stir, and remove from the heat. Sprinkle the mushroom mixture over the fish and bake, covered with foil, for 20 minutes, or until the fish is opaque and firm. 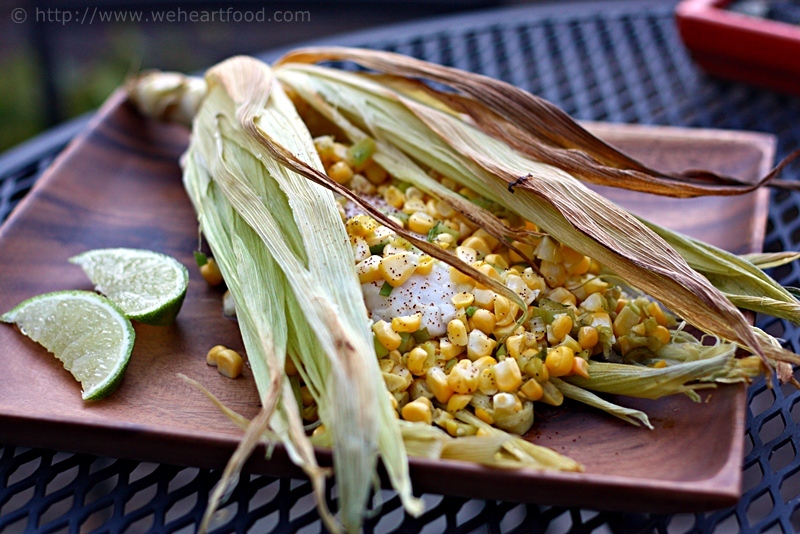 This recipe from Elise’s Simply Recipes is quick and flavorful. 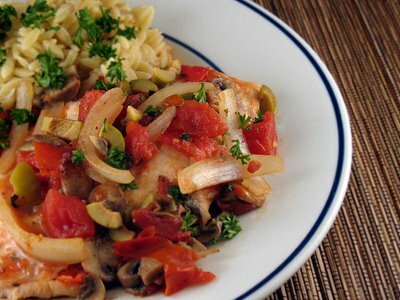 Tilapia is cooked in a tomato, mushroom, and olive sauce, right on the stove. 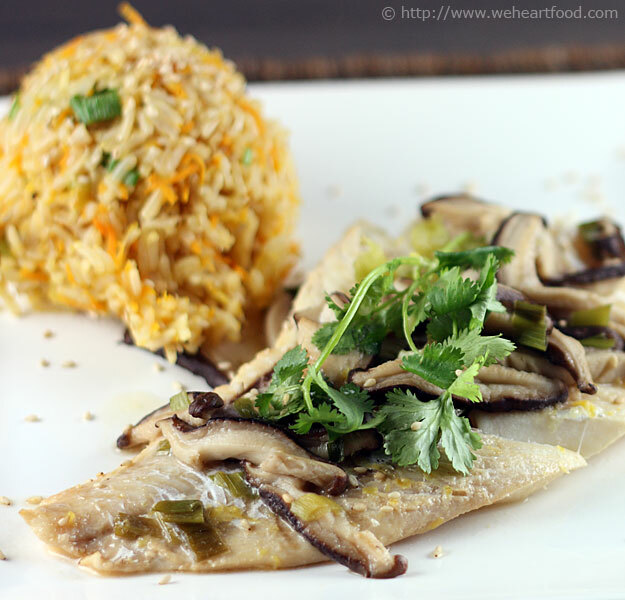 We served the fish with a side of orzo. The better for you to pick them out, my dear. …and only one. I do like the flavor of the sauce though! I like the speed of this dish. I’m all for getting food to my mouth sooner. In a large skillet over medium heat, add the oil, then cook the onions until softened, 2-3 minutes. Add the garlic, cooking for an additional minute. Add the tomatoes, mushrooms, olives, oregano, salt, and pepper, and bring to a boil. 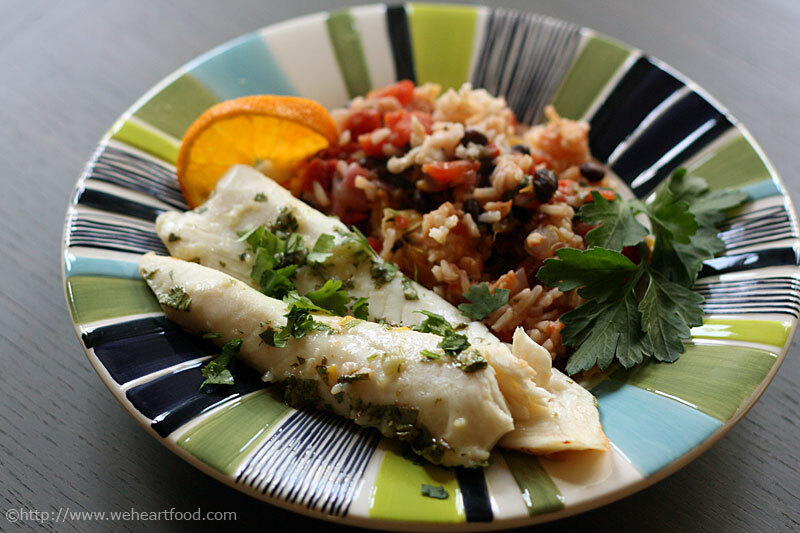 Add each tilapia fillet to the pan and cover with some sauce. Bring back to a boil, then lower the heat, cover, and simmer for 8-10 minutes or until the fish flakes easily. Use a wide spatula to gently remove the fish from the pan, transfer to a serving plate, and top with the sauce.